WHEN IS A WRECK NOT A WRECK ? When is a Wreck not a Wreck? An answer seems easy, but not always obvious. A ship that has been wrecked might be raised and then float again. It might sink again, immediately, or soon after – and declared a wreck once more. It may be repaired, and live out many more years afloat. Alternatively, the raised wreck may be towed away and scrapped. In each case bar one, it will continue to be referred to as a ‘wreck’. 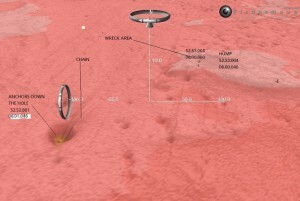 For the purposes of irshwrecks.com, we need to know if it has remained a wreck – and where it lies! ID No 6825, the NESTORIAN, is listed in our database (and others) as having wrecked off Jack’s Hole, Mizen Head, between Arklow and Wicklow Head, east coast of Ireland. On route to America from Liverpool, under the command of captain David Cowans(Cowen), with a crew of ‘twenty two, composed of men of all nations’, the relatively new 800 ton American timber sailing ship struck the Arklow Bank in November, 1858. Suspected to have badly damaged her hull, the barque soon slipped off the Bank, and was pooped with a large amount of water, carrying away a significant amount of equipment and rigging. Anchors were let go, the pumps failed to stem the ingress of water, and she sank. The Nestorian was abandoned and then sunk on Novemeber 25, roughly midway between Jack’s Hole and the north end of the Arklow Bank. A lifeboat from Arklow failed to make the wreck, but Dr Halpins’ lifeboat from Wicklow met the survivors in their own boats off Bride’s Head, and towed them into Wicklow. Although there were accusations of cowardice, there was only one fatality. 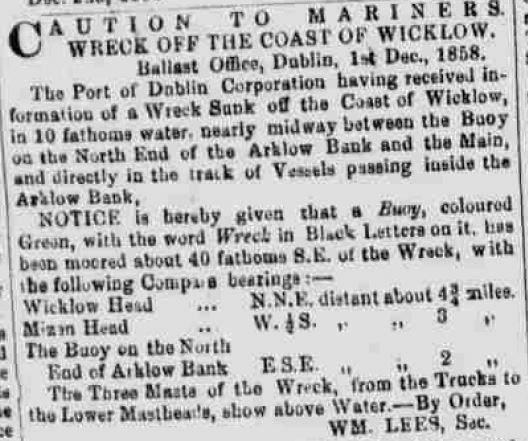 The marine authorities in Dublin were notified of the loss, and on December 4, it was announced in the Press, that instructions had been issued to place a ‘wreck buoy’ at the sight of the wreck. The instructions were carried out remarkably quickly, which probably had more to do with a potential salvage claim arising from the abandoned vessel, than acting as a warning to mariners, as the tops of her three masts were clearly visible above the water. The transits of the wreck were published, along with notice of the placing of the wreck buoy. Position of Wreck Buoy NE of Mizen Head as shown on some Admiralty charts for many years afterwards. It seemed a pretty simple operation to plot it, refer to INFOMAR (Irish Seabed Surveys), and just go out and find her. We did most of that, and as well as starting with a good estimate of the wreck’s position, we were confident we could see the wreck on the survey. It was a relatively unremarkable vessel, so we decided to leave it alone until something more interesting presented in that area. Some optimistic estimating of wreck position on survey by INFOMAR. 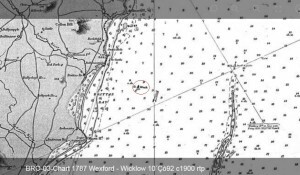 A couple of years later, intending to continue a search for the Aid (1804), along the shoreline north of Wicklow – The Murrough to Killoughter – we began to study wreck reports for the area. 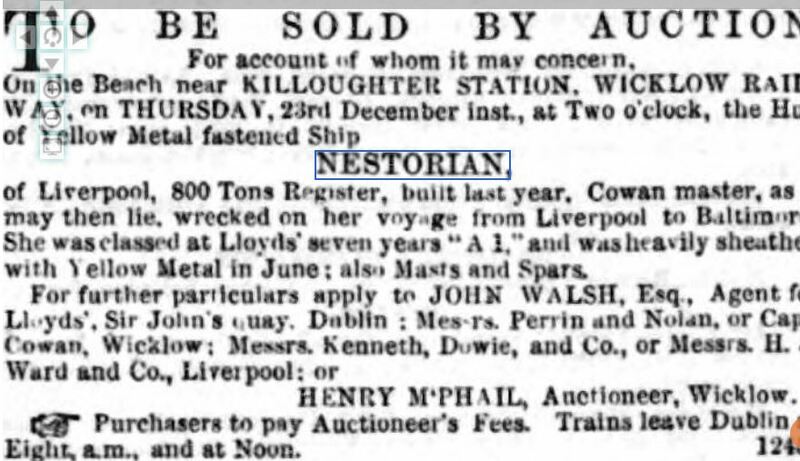 Much to our surprise, we spotted an advertisement for a wreck auction on the shore near Killoughter railway station, for the Nestorian. 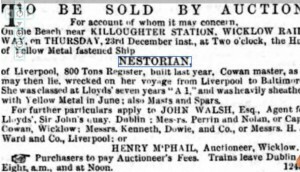 It was December 21, and the wreck, ‘Yellow metal- fastened ship’, was to be auctioned on the beach at Killoughter, after being officially declared a wreck, eleven miles further south, and on the opposite side of Wicklow Head. The answer was simple, but not obvious. The Nestorian was carrying a cargo of salt. After lying on the seabed for some weeks, the salt dissolved, the ship became buoyant again, and the 800 ton barque popped up to the surface – just like a mine. A tug was sent from Liverpool, and began a tow to Kingstown (Dun Laoghaire). When she got off Wicklow Head, the stricken vessel fell over and filled again. Remaining barely afloat, the large ship was towed around The Head, and beached near Killoughter – where she was sold by auction and subsequently broke up on site. Even though she floated and travelled again, she remained a ‘wreck’, until broke up on the beach at Wicklow, after which she did not exist. The Nestorian had remained a wreck until she was broken up, but just wasn’t ‘wrecked’ in the place first reported. The whole operation was reminiscent of what became of Lord Cloncurry’s famous cargo of Roman marbles – ‘lost by shipwreck in Killiney Bay’’, when they were lost ‘in’ the Aid after she was blown down off Wicklow Head in 1804, and towed into the same place as the Nestorian. Although this wreck has been declared, ‘located’, we believe this not to be the case. Posted by roystokes. Categories : Archaeology, Arklow, Coastguards, Diving, History of Wexford, Liverpool, Maritime Adventure, Maritime Mysteries, Tales of Shipwreck. 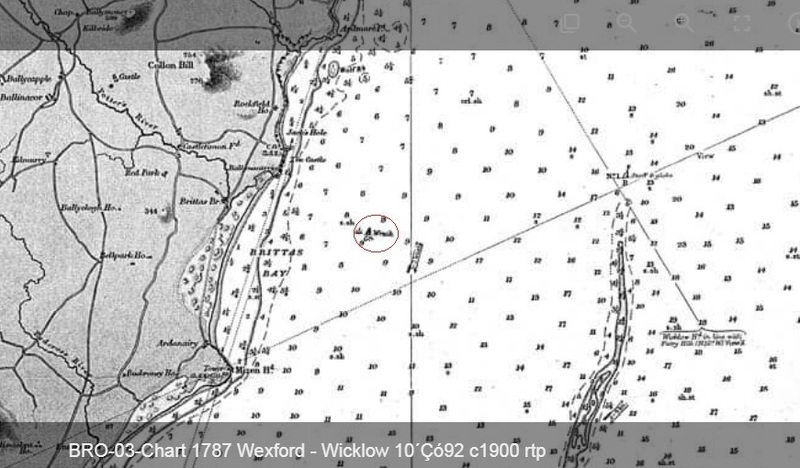 Tags : archaeology, Arklow, divers, diving, Infomar, Kingstown, sandbank, underwater, Wexford, Wicklow.